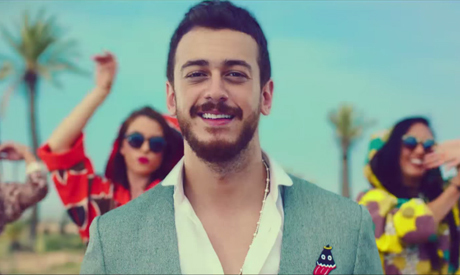 Still from Saad Lamjarred's music video "LM3ALLEM"
The music video by Moroccan superstar Saad Lamjarred, Lmaallam (The Boss), has been viewed nearly 103 million times on YouTube, making it the most viewed Arabic music video. Lamjarred posted a picture to celebrate Lmaallam being the most watched Arabic music video on YouTube, after a mere three months since its release. The song topped the music charts in Morocco, and the music video went viral in a matter of days on all social media platforms gaining millions of YouTube views daily. Emirati Hussein Al-Jasmi is the only other Arab artist to have secured such a large outreach on YouTube with his song Bouchrat Khir. In May 2015, Lmaallam earned a Guinness World Record after gaining nearly 23 million views on YouTube within three weeks of release. Saad's song Malo Habibi Malo (What’s wrong with my lover) has been viewed over 85 million times on YouTube to date. The 30-year-old star was born in Rabat. He was only four years old when he first started singing. He is the son of the famous singer Bachir Abdou and the popular comedian Nezha Regragui. Lamjarred, considered one of the most influential artists of his generation, is a contemporary Moroccan singer, author and composer. He began his journey singing his father’s songs, and resumed his career after studying music theory at the National Conservatory of Music in Rabat. He earned much of his fame after participating in the fourth season of the Lebanese talent show Super Star in 2007, where he came second. Moreover, he also played the lead role in a Moroccan TV series titled Ahlam Nassim. His hit single Enty was nominated for the Best Middle East Act in the 2014 MTV Europe Music Awards, and won Best Arabic Song for the same song at the Lebanese Murex D’Or Awards.